Honest To Goodness To Go! 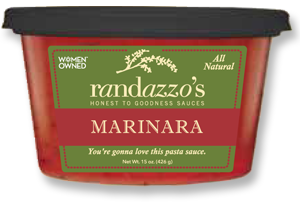 The sweet and savory flavors of Randazzo’s Honest to Goodness Marinara Pasta Sauce make it the most versatile sauce in the product line. As a straight up marinara, this sauce highlights the sublime sweetness of the tomato. As a premiere pizza sauce, it is rich in texture with chunks of ripe plum tomatoes that can hold their own as the base of a plain cheese pizza or can compliment a wide variety of toppings. Add meatballs, sausage, and bracciole and serve over pasta to recreate Randazzo Sunday “gravy” at home.